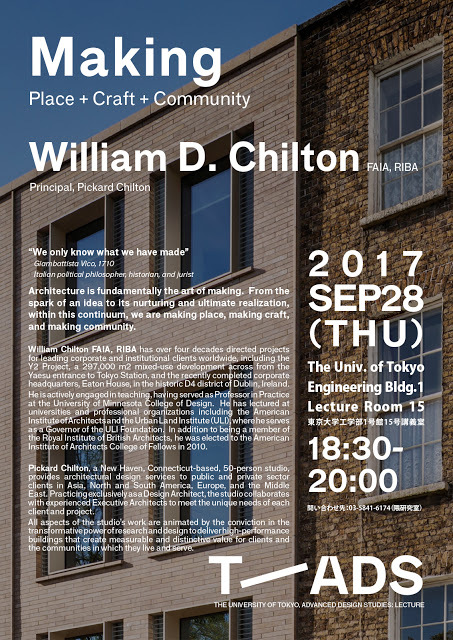 At the invitation of noted Japanese architect, Kengo Kuma, William Chilton presented a lecture to graduate and undergraduate architecture students as well as guests, and members of AIA Japan at the University of Tokyo on the evening of 28 September. Previous lecturers include Fumihiko Maki, Peter Eisenman, and Rem Koolhaas. Entitled Making: Place + Craft + Community, the lecture was based on the premise that architecture is fundamentally the art of making and within the design and construction continuum, architects, are making place, making craft, and, ultimately, making community.